In case you hadn't heard, 2005-06 is the Year of the Rookie. Two drafts-worth of talent, a salary cap, new rules and a couple of the most talented number one picks in a generation have all conspired to make this year's crop of rookies among the best the League has ever seen, top to bottom. But what about that top? With Capitals phenom Alexander Ovechkin "pulling away" in the rookie scoring race (though something tells me it will be anything but an easy race to win) and other rookie forwards (Sidney Crosby and Marek Svatos), defensemen (Dion Phaneuf) and goaltenders (Henrik Lundqvist and Ryan Miller) all putting up sensational numbers, one wonders where these seasons will stand relative to the great rookie seasons of all-time. To put this year's rookies' numbers in context, The Rink has thrown together a list of the top eleven rookie performances in NHL history. Why eleven? Because leaving off a kid who started so quickly and shone so brightly among the best in the game would have just been wrong. As always, this list is intended to spark debate and is by no means inclusive of all the great rookie seasons in NHL history. One thing is for certain, though: whoever wins the Calder Trophy (for rookie of the year) this year will have to be mighty impressive to make it onto this list. 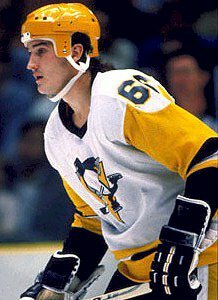 11) Mario Lemieux (1984-85; pictured) - The first overall pick in the 1984 Entry Draft, "Super Mario" scored a goal on the first shot of his first shift in the NHL and there was no looking back. He would go on to rack up 43 goals and 100 points, be named All-Star Game MVP, selected to the All-Rookie Team and win the Calder Trophy. 10) Brian Leetch (1988-89) - The former Boston College Eagle still holds the record for most goals by a rookie defenseman (23) and tallied the second most points by a first-year rearguard (71) in his All-Rookie, Calder-winning season. 9) Joe Nieuwendyk (1987-88) - "Cornell Joe" scored 51 goals (including 31 on the power-play and eight game-winners) and added 41 assists for the Flames. He was named to the All-Rookie Team and won the Calder Trophy to round out a fine freshman season. 8) Larry Murphy (1980-81) - Murphy set the current assist (60) and points (76) records for rookie defensmen, but finished second to Peter Stastny for the Calder Trophy. 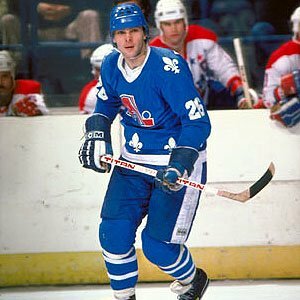 7) Peter Stastny (1980-81; pictured) - Stastny's rookie campaign saw him set the current rookie record for the most assists in a season (70, later tied by Joe Juneau) and the former rookie record for the most points in a campaign (109), which stood for more than a decade. Highlights from the middle Stastny brother's Calder-winning season include hat tricks in back-to-back games and an eight point game in the second of those two on February 22, 1981 against some team from the D.C. area. 6) Dale Hawerchuk (1981-82) - "Ducky," taken first overall in the 1981 Entry Draft, made an immediate impact, both individually (with 45 goals, 103 points and the Calder Trophy) and for his team, the Winnipeg Jets, whose 48-point improvement over the previous season is still the largest single-season turn around by an NHL team. 5) Mike Bossy (1977-78) - The New York Islander rookie set a then-rookie record for goals with 53 and notched 91 points while finishing +31 for the season - all good enough to win the Calder Trophy and be named to the NHL's Second All-Star Team. 4) Terry Sawchuk (1950-51) - "The Uke" played every game for Detroit in his rookie year and led the NHL in wins (44) and shutouts (11), winning the Calder and being named to the named to the NHL's First All-Star Team along the way. The man this list nearly forgot (see comments) was the first man to be named rookie of the year in three different Leagues (the USHL, AHL and NHL). 3) Patrick Roy (1985-86) - "Saint Patrick" was somewhat mortal during the regular season, as he went 23-18-3 with a 3.35 goals againt average and a .875 save percentage and made the All-Rookie team, but didn't win the Calder - Gary Suter did. But Roy would have the last laugh (or at least the best laugh) as he got white-hot, going 15-5 with a 1.92 goals against average and leading the Habs past Suter's Flames in the Stanley Cup Finals. For his efforts, Roy was awarded the Conn Smythe Trophy as the playoffs' most valuable player. 2) Teemu Selanne (1992-93) - "The Finnish Flash" set current rookie records for most goals (76) and points (132) and led all rookies in power-play goals and game-winning goals en route to the Calder Trophy. Selanne was also an All-Star, an All-Rookie team member and a member of the NHL's First All-Star Team in his jaw-dropping rookie campaign. 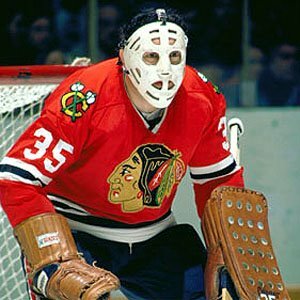 1) Tony Esposito (1969-70; pictured) - Claimed by Chicago from Montreal in the Intra-League Draft earlier in 1969, Tony "O"'s first full year in the NHL was full of wins (a 38-17-8 record), shutouts (15, the most by a rookie and second most all-time), saves (a 2.17 goals against average) and hardware (Esposito won both the Calder and the Vezina Trophies, becoming the first rookie to win the latter since Frank Brimsek in 1939). Honorable Mention (in no particular order): Gary Suter, Grant Fuhr, Luc Robitaille, Joe Juneau, Raymond Bourque, Martin Brodeur. Labels: Brodeur M., Crosby S., Lemieux M., Ovechkin A., Phaneuf D., Sabres, Stastny Pe. Please don't forget Terry Sawchuk? He might be the ultimate ROY. Sawchuk played EVERY game for the Red Wings and led the league in wins(44) and shutouts,(11) winning the Calder Trophy in the process. Sawchuk's first years on any level were remarkable in that he was the first player ever to be named rookie of the year in three different leagues: with Omaha in the USHL, with Indianapolis in the American Hockey League and in his first full year with Detroit in the NHL. See? This is why I post these list - so you people can straighten me out. I'll make a change. Joe Juneau deserves honourable mention, his 102 points would have been good for a Calder were it not for Selanne's spectacular numbers. Juneau's 70 assists is still a record for a left winger - rookie or otherwise. That Gretzky kid won the Hart and tied for the league lead in scoring in his first year. He started that season at age 18. You're not still holding that NHL-WHA grudge, and calling his time in the WHA as a 17 year old his rookie year, are you? He wouldn't have even been allowed to play in the NHL at 17. One of Gretzky's two "rookie" seasons must surely be on this list. Take your pick. In the WHA, starting the 78-79 season as a 17 year old (!) Gretz recorded 43G, 61A. After the WHA/NHL merger, he was ruled ineligible for the Rookie of the Year, which he would have easily won with 51G & 86A. I wrestled with the Gretzky issue and decided that since Gretz's time in the WHA made him Calder-ineligible - and thus he never had a rookie year in the NHL - he wouldn't be considered for this list of best NHL rookie seasons. In the Great One's rookie season in the WHA, there were only six teams at season's end, four of which joined the NHL. Gretz had a full season playing against future NHL talent, including the likes of Mark Howe, Kent Nilsson, Richard Brodeur, Mark Messier, Rob Ramage, Ken Linseman, etc. In short, he had gained an advantage over true NHL rookies after the merger, so that season wasn't considered. Besides, it's nice to see a list without Gretzky at the top every now and again. Here's a question, though - with the lockout last season and a flood of NHLers playing in the Russian Elite League last year, didn't Alex Ovechkin gain a similar, if not greater, advantage? What MT said. The kid from Brantford has to be on the list one way or another. If there was no WHA, Gretz would have been an NHL rookie, would have been Calder-eligible, and would have won. And if my aunt had balls, she'd be my uncle. Look, this is a list of NHL rookie seasons, not WHA rookie seasons and not first years in the NHL for non-rookies. My list, my rules. But feel free to insert the Great One wherever you feel he belongs when you read the list to yourself. "Here's a question, though - with the lockout last season and a flood of NHLers playing in the Russian Elite League last year, didn't Alex Ovechkin gain a similar, if not greater, advantage?" Yes, I'd say he does have an advantage over, say, Crosby for that reason. Same goes for Selanne, and Stastny, Makarov and so on. That's what makes Gretzky's arbitrary ineligibility so hard to swallow. It was always just WHA resentment. Not to beat this dead horse any more, but Stastny, Selanne and Makarov didn't bring 2/3 of their entire leagues with them into their first NHL campaigns. In my view another omission from the list is Ken Dryden - 39 wins (1 more than Espo got in his rookie season) only 8 losses and 15 ties in 1971-72, plus a solid 2.24 GAA. Just because he is now a boring, long-winded politician he should still be recognized for what he did between the pipes. I don't mind seeing Gretz at the top of lists, he's earned that spot. The unfairness was that Stasny was Calder eligible at age, 25 after a great career in an elite European pro league. Wayner came from a league many NHL old-timers said was bush, but he was ruled ineligible, a pretty small-minded decision given the contribution he made (and continues to make) to the NHL, to the sport and to Canada. Nonetheless your list and the debate is terrific. I definitely overlooked Dryden. What do you say that in the interest of fairness to the Big Red, we bump fellow Cornell alum Joe Nieuwendyk to the H.M. list and put Dryden in there at 9th? How about an honorable mention (at least from a fantasy perspective) for Dale Hunter? 63 points (19, 44) and 226 PIMs. What a monster. or Ron Francis - 68 points in 59 games - while playing all his home games in a mall.